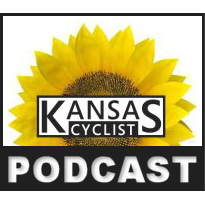 Welcome to episode number 9 of the Kansas Cyclist Podcast. This edition features an interview with Julie Cirlincuina, author of Kansas Outdoor Treasures: A Guide to Over 60 Natural Destinations. The book is an invaluable guide to many of the best outdoor places in Kansas to bike, hike, paddle or just explore. Kansas truly has a wealth of diverse geography within its borders, much of which is little-known even to people who’ve lived here all their lives. Kansas Outdoor Treasures will help you find these exciting destinations and guide you into discovering the best Kansas has to offer. You can learn more about the book at Julie’s web site, TrailsOfKansas.com. In this episode we also get a chance to talk with Dr. Ken Sonnenschein, who is the event coordinator for Bike For The Brain, a ride that promotes increased understanding about brain-based illnesses. The event takes place on Labor Day, Monday September 7, 2009 in Mission, KS. Nearly one in three Americans will experience some form of mental disorder in their lifetime, but due to stigma and misunderstanding, seventy to eighty-five percent of these people do not get help for their condition. Events such as Bike For The Brain can help to change that, as well as raising money to support this important work. On August 22nd there are four rides in western Missouri: the Missouri River Festival Bike Tour in Boonville, the Ride For Life Bike Tour in Lees Summit, the Svitak Freedom Ride out of Joplin, and Bike To Battle Cancer, in Ozark, Missouri, just south of Springfield. Also on the 22nd is a ride called Onabike, which is held in Onawa, Iowa and is billed as “western Iowa’s largest one-day bike ride”. Sunday August 23rd features the Horsetooth Double Dip tour in Fort Collins, Colorado, the Heatstroke 100 in eastern Nebraska, and the Cape Race in Cape Girardeau, part of the Midwest Fat Tire Series of mountain bike races. For fat tire enthusiasts, there is Cruise the Blues on August 29th, a mountain bike festival that takes place on a family farm near Tipton, which is located in North Central Kansas. On August 30th, Kansas cyclists have two rides to choose from, with PedalFest taking place in the scenic countryside around Wichita, and Tour de Shawnee, which rolls out of the bicycle-friendly city of Shawnee, Kansas. Elsewhere around the region, there’s the Moonlight Ramble in St. Louis, Missouri, with over 10,000 riders hitting the streets for a midnight ride on August 29th. Also on the 29th are two BikeMS rides in Iowa: The Cruise the Cornfields ride takes place in the Des Moines area, and Cycle Cedar Valley rides out of Cedar Rapids. Both of these are two-day, 150-mile events to raise money for the Multiple Sclerosis Society. The Kansas City, Missouri area hosts the Summer Breeze ride on the 30th, put on by the Kansas City Bicycle Club, and Longmont, Colorado plays host to Venus de Miles, Colorado’s first women’s-only bike ride, also on August 30th. And looking ahead, we have the Gorilla Century out of Pittsburg, Kansas on September 5th, Bike for the Brain in Mission, Kansas on September 7th, and the third running of the Tour of Missouri professional stage race, beginning in St. Louis on the 7th and ending in Kansas City on the 13th. There are many more ride opportunities available nearby, so please view the regional calendar for a complete list. This one’s not in Kansas, but it’s close! I recently had the chance to ride the new mountain bike trails at Swope Park in Kansas City, Missouri. Swope Park is one of the largest urban parks in the nation, and the Earth Riders Trails Association has been working for several years to bring mountain bike trails to this rugged landscape. The first stage opened late last year, and the second section opened this summer. There are currently a little over three miles of trails here, and the group has really done a fantastic job in designing, building, and maintaining this singletrack. This is not a beginner-level trail. There are some easy sections, but there are some really tough sections as well. The scenery is really pretty incredible, and all the things that make the trail difficult to ride make it really fun and rewarding to look at. Even though you’re in the heart of a major city, it certainly won’t feel like it. This trail is a great experience. Plans call for something like 16 miles total at Swope, plus another trail to connect to the Blue River Parkway trails in South Kansas City, yielding roughly 50 miles of mountain bike trails. You can learn more about the trails, and about volunteer opportunities, at swopetrails.com or earthriders.org. Each episode, we discuss an aspect of bicycling safety. This time, we discuss a type of collision known as “The Crosswalk Slam”, where you’re riding on the sidewalk and cross the street at a crosswalk, and a car hits you while attempting to make a right turn. The main way to avoid this is pretty simple: Don’t ride on the sidewalk! Studies show that sidewalk-riding is twice as dangerous as road riding, and The Crosswalk Slam is just one reason why. Thanks to BicycleSafe.com for the safety tips. And thanks also to Mark Franzke, who’s graciously provided original music for the Kansas Cyclist Podcast. You can find out more about Mark and his music and art by going to Banjodog.com. As always, we hope you’ll listen to the Kansas Cyclist Podcast, and consider subscribing to future episodes. We welcome your feedback, so please send in your comments or suggestions.